Published: Dec 9, 2016 to ? When he realized it, the protagonist was in another "game-like" world and had become a sword that was stabbed in the ground in a great forest, overrun with beasts. At least, that was until he met with a cat girl that was about to be attacked by a bear type beast. This will be a short review. 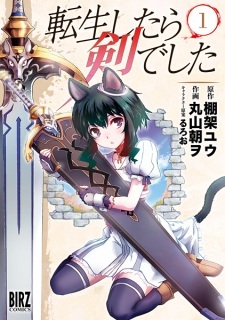 As many types of this manga, it is based on a Light Novel. This manga has great art, serviceable story, lovable main characters and good humor. The story isn't bad but has tons of potential. The art is great and is one of the things I like very much from this manga. I want to emphasize in the humour this manga has. It doesn't have your slapstick humor or funny-haha humour, but more of a funny, warm-hearted humor. Give it a chance if you're still not tired of the "transported into another world" or "reincarnated into another world" type of manga/story. So after realizing that i originally accidentally reviewed the Light Novel version. I decided to come and review the Manga. My LN review still fits how i feel about the LN. But i really love this. Fran is adorable and amazing. The art really works well with facial and comedic expressions. I like that the MC is OP but he only really starts excelling when someone is wielding him. Things like Fran's parents being dead i'm not really liking that. I like the idea that one of the missions of the story is to reunite Fran's parents or at least her mother. I'm still holding out that they're still alive and Fran has just thought they've been dead all the time. Her parent not knowing where the daughter has gone. Just for the parent to be reunited with their daughter when she's grown up a bit and finds out she's been a slave for 4 years and now she's an adventurer with blood on her hands. I think that would be awesome. Also when we got Amanda ( If i remember how to spell it ) Seeing Fran for the first time and saying that she's Fran's mother got me excited. Even though they are different species i'd say it's possible that sense the memories Fran of her mother was when she was young so after 4 years she could've forgotten some things. I'm also a fan that this story doesn't hold back and has the characters actually kill off people. Stories can be kind of annoying when they're too afraid kill someone off. I can definitely see this is an Anime form and i really hope we get it in anime form. Overall a awesome story that i hope picks up even more traction soon.